The second training programme conducted by SEAMEO QITEP in Language in Fiscal Year 2013 is Training on Teaching Methodology for Japanese Language Teachers which was held on 7-18 October 2013. 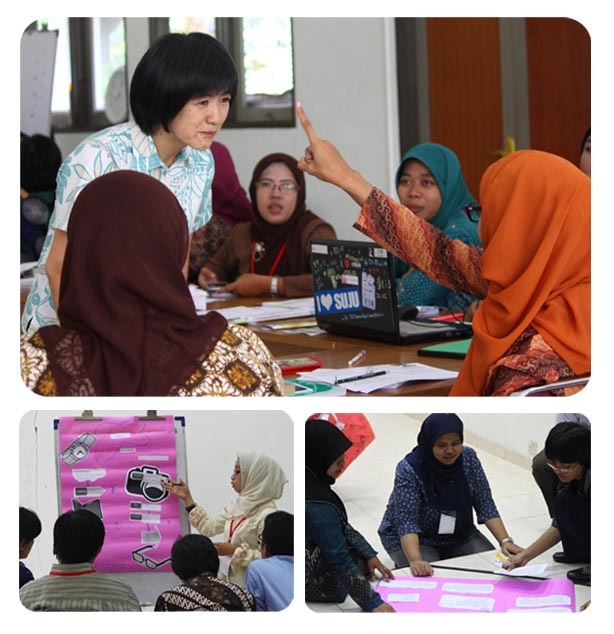 Twenty Japanese language teachers from eight provinces in Indonesia, namely Bali, Banten, Central Java, DI Yogyakarta, Nangroe Aceh Darussalam, South Borneo, West Java and West Sumatera were participated in the training. It aims to enhance the competence and professionalism of the Japanese language teachers, particularly in their teaching methodology. During the training, the participants gained new information and skills from the resource persons. They were experts in Japanese language teaching, namely MsNaltiNovianti (Bina Nusantara University), MsNiaSetiawati and MsYuniarsih (Jakarta State University), MsEviLusiana and MsHatta Naomi (The Japan Foundation) as well as Dr Felicia NuradiUtorodewo (SEAMEO QITEP in Language). It is hoped that the participants could teach Japanese language with various and fun learning techniques to boost the students’ communication skills. They should also be able to design assessment to evaluate students’ learning outcome as well as to develop new strategies to enhance the students’ cross cultural understanding. In the ten-day training, the participants visited Ancol which is one of Jakarta’s famous tourist attractions, shopped at Japanese famous retail store as well as dined in a Japanese restaurant in Jakarta. They also had the chance to learn Japanese paper folding art (origami), Japanese calligraphy (shodo) as well as to wear Japanese traditional clothes, such as yukata and happi. At the end of the training, the participants presented their lesson plan to the resource persons as well as to their fellow participants.